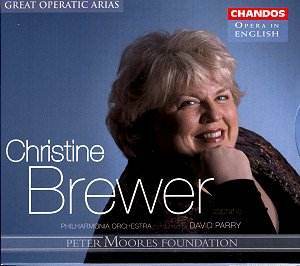 I have long been a fan of Christine Brewer. Her contribution to the Hyperion Schubert Edition is certainly one of the best of that superb series (CDJ33031), and her singing in Zemlinsky's Es war einmal at the RFH in 1999 (see review) confirmed a major talent. At the time I wrote of her 'evocative, musty mezzo-like tone in the lower registers and no shortage of power in the higher ones' and I see no reason to change my judgement on present evidence. It is right that her stature be recognised in the fine Chandos series. Wagner's 'great Hall of song' ('Dich teure Halle') from Tannh�user is an excellent vehicle to begin any recital. A shame then that the extended orchestral introduction is far from spotless. Low on dynamism and occasionally slack of ensemble, in a sense it highlights Brewers' magnificence on entry. Her lyrical line is superb. Only one point of diction raises its head � she comes very close to singing, 'I honour you with all me 'eart' (you can hear the 'h'; of 'heart', but only just). Donna Anna's Vengeance Aria (with preceding accompanied recitative) is marred by an OTT, hammy Barry Banks and the orchestra again go through the motions for the aria proper. Interestingly, there are some attempts at 'period' articulation in the strings for the Gluck Alceste excerpt. Far fewer nods to authenticism from Brewer � this is an advert for her, and heard as such it is impressive. The radiant opening of 'Ocean! Thou mighty monster' alas leads to a sag in tension. At around 7'10 in this aria, Brewer positively bursts forth, and so does Weber. The orchestra however doesn't share this idea ('O transport! ', 7'06). More Weber from Euryanthe, wherein Brewer's top register glistens but retains her characteristic depth of tone. Janice Watson is well chosen as her companion here, her voice complementing Brewer's to perfection. Sullivan's The golden legend is new to me, and Brewer makes a superb case for it. Her legato is now almost luminous, and the chorus appear on top form. Really beautiful. The Rossini excerpt is highly dramatic, but perhaps the climax of the disc comes in the form of Beethoven's concert aria, Ah perfido! This is the only item on the disc when the Philharmonia actually sounds interested. I immediately wanted to experience this again after hearing it the first time, such was its effect. It feels as if Brewer has 'arrived' and that here she is completely at home. The more 'poppy' items (de rigeur in a recital such as this) from Leh�r, Rodgers and K�lm�n are all entered into the spirit of. The Carousel excerpt is a haunting way in which to end, but of this lighter end of the spectrum it is perhaps the Countess Maritza (to give the title in English) excerpt that impresses most. Brewer soars magnificently. The generative impulse for this disc was Brewer's recording of Fidelio - to be reviewed shortly. Chandos's faith in her has been justified, completely and utterly.